Coleraine sealed their place in the sixth round of the Irish Cup with an emphatic win over Carrick Rangers. A hat-trick from Eoin Bradley and a brace from strike partner Jordan Allan sealed a 5-1 win for Oran Kearney’s men. The Bannsiders made the perfect start as the returning Bradley slotted home after he latched on to Adam Mullan’s long ball with only two minutes on the clock. The hosts doubled their advantage six minutes later after they were awarded a debatable penalty. Allan slotted home after there was a coming together between Jamie McGonigle and Johnny Wilson in the box. 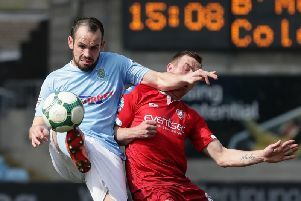 Carrick boss Aaron Callaghan was incensed by the decision, but was sent to the stands for taking his protestations too far. Bradley almost grabbed his second on 15 minutes, but his lob came back off the post and Neeson saved the follow up. At the other end Mark Surgeoner flashed a header wide with Chris Johns beaten. The visitors were the architects of their own downfall on 26 minutes as Allan charged down Neeson’s clearance and slotted home the third. Neeson redeemed himself before the break with a great save to deny McGonigle after he weaved his way through the visitors’ defence. Coleraine almost grabbed a fourth on the hour mark but Darren McCauley’s dinked finish over Neeson was hacked off the line by Steven McCullough. Carrick grabbed a lifeline with 17 minutes to go as Neil McCafferty diverted Sean Noble’s cross into his own net. But the Bannsiders made sure there was to be no comeback as Bradley fired in a quickfire double to complete his hat-trick. It was two great finishes from the striker to seal the Bannsiders place in the sixth round. Coleraine: Johns, Kane, Mullan, Douglas, Ogilby, McCauley, Kee (McCafferty 50), Lyons (Parkhill 71), McGonigle, Bradley (Twigg 83), Allan. Carrick Rangers: Neeson, Surgeoner, McVey (Hanley 46), McCullough, Lavery, Foster, M Murray, Wilson (T Murray 13), Morrow, O’Connor, Sally (Noble 58).